Do you like walking the Planes? Do you consider yourself a Planes . . . walker? Well, as you may know, War of the Spark features 36 Planeswalkers! That's a lotta Planeswalkers. And you know what one does when there are that many Planeswalkers? Well, you vote for your favorite in a head-to-head competition, duh. What else would one do? We are proud to announce the Planeswalker Tournament! We have seeded these 36 Planeswalkers into a bracket using the most advanced algorithm in the Multiverse, and we want you to vote on them! But before you vote, be sure to download the bracket (available in .pdf and .png formats) and fill it out. 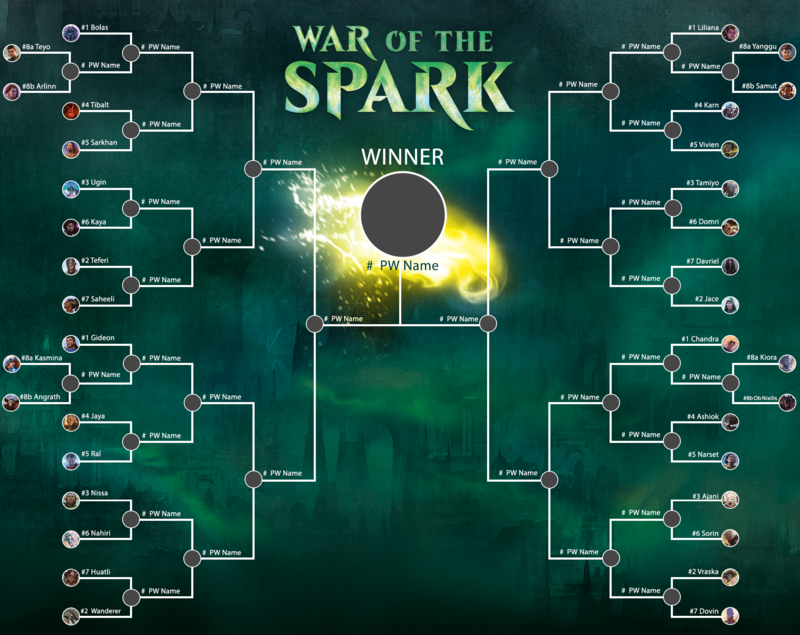 Because those who (somehow) get a perfect bracket will receive a foil set of all 36 planeswalkers in War of the Spark! Win, and you'll slide into your next Friday Night Magic as the coolest person there, sunglasses indoors and all. You have until Friday, April 12, to fill out your bracket and submit it to MagicCommunityTeam@Wizards.com. But be sure to have both a Wizards Account in good standing as well as an Organized Play Account. One bracket per person, naturally. Also, read all the legal stuff before entering so there are no surprises. Those who submit a perfect bracket will win a set of 36 foil planeswalkers from War of the Spark! Who do you think is going to win? Make sure to pay attention to our social channels and vote, and good luck to all of you.